This meal provides you with two of your five-a-day and is a good source of high-quality protein. 1. In a non-stick frying pan, add 2 tsp of the olive oil and cook the red onion and garlic over a medium heat for 5 to 10 minutes until soft. 2. Remove the pan from the heat, transfer the onion and garlic to a small bowl. 3. Add 1 tsp of olive oil to the frying pan, turn the heat to high, then add the spinach and peas. Cook for a few minutes until the spinach has wilted, then add the cooked onion and garlic, spreading the mixture evenly to cover the base of the pan. 4. Crack the eggs into a bowl with the milk and whisk until fully combined, then add the chives, salt and pepper. Pour the egg mixture over the vegetables in the frying pan. 5. Heat the grill to medium. Dot the egg mixture with pieces of goat’s cheese and turn the heat down, leaving the frittata to cook until the egg starts to set. 6. Now place the pan under the grill to cook the top of the frittata until it starts to brown, approximately 10 minutes. 7. Remove the frittata from the grill and leave it to cool for a few minutes. 8. While the frittata is cooling, evenly divide the salad leaves between two plates and dress with olive oil and lemon juice. 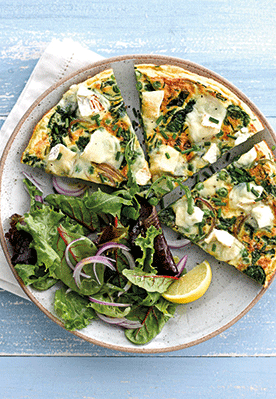 Carefully slide the frittata onto a chopping board, slice and serve on the plates with the salad.